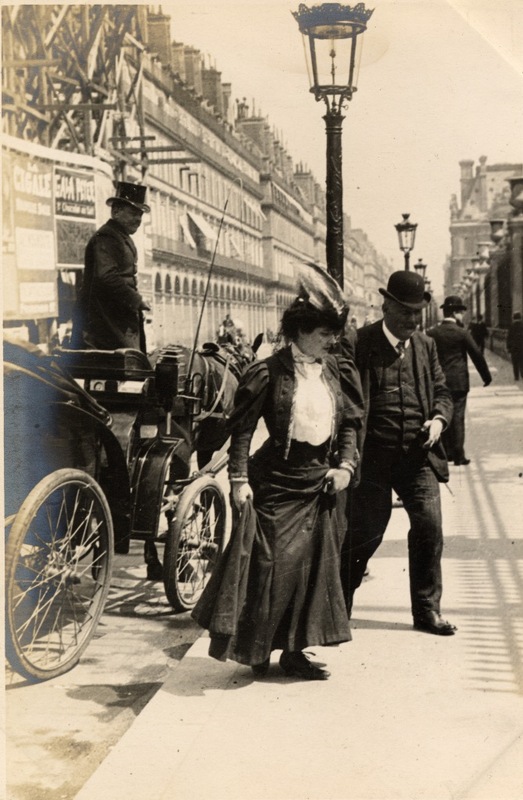 There was quite a bit of interest in my first post about Edward Linley Sambourne’s street photography so now that Victorian month is over we can go back to the early years of the 20th century and follow Sambourne to Paris. He was 62 in 1906. He might have been slowing down a little. As it happens he only had four years to live. But he was still full of energy, and as we saw in the previous post still an enthusiastic photographer. 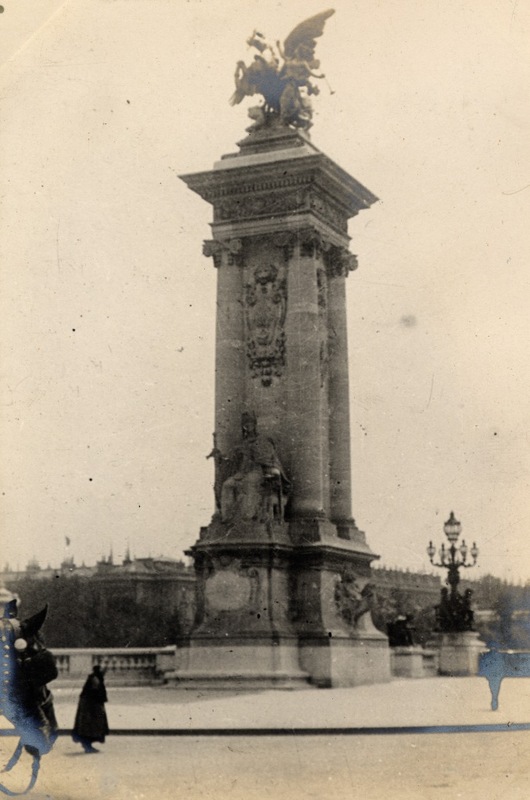 He took a few trips abroad that year including the one in June to Paris, then as now the centre of European fashion. A prosperous couple alight from a carriage. 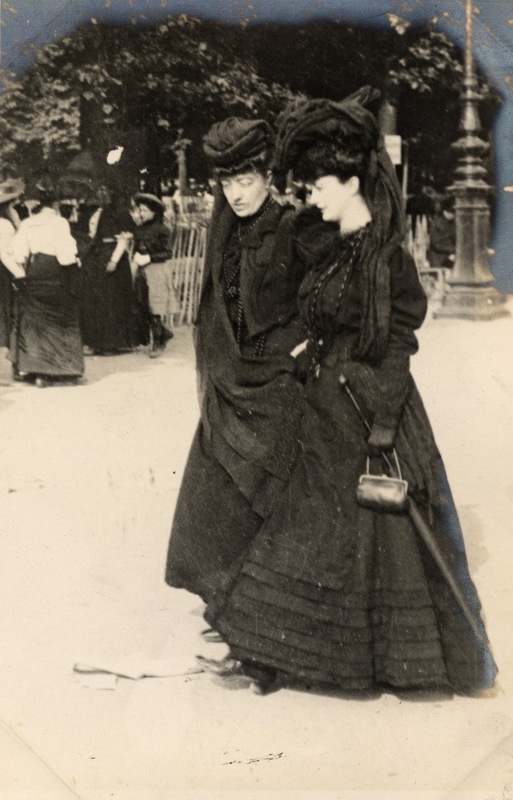 Below, two fashionable women cross the same boulevard, skirts lifted to avoid the dusty surface of the street, also seemingly unaware of Sambourne’s camera. As you might have expected the ladies of Paris are better dressed than their counterparts in London and a little more formal in their style. 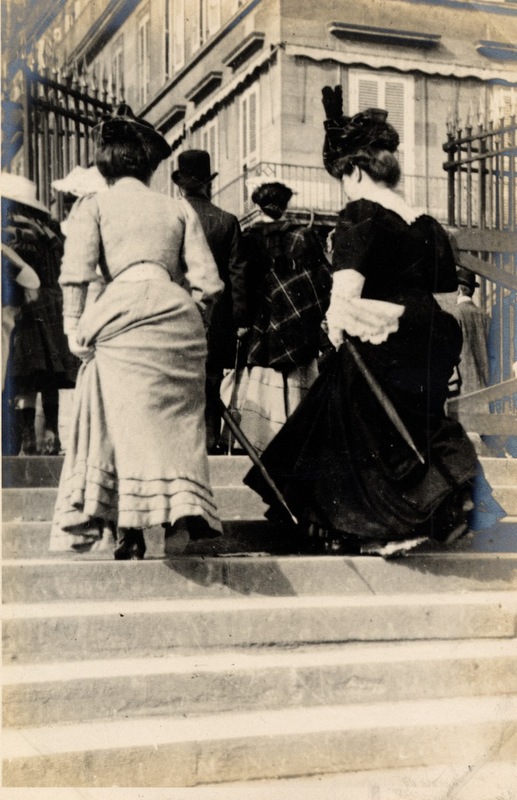 This woman, younger than the others strides confidently up the steps. She has the same casual attitude and natural ease we saw in London. 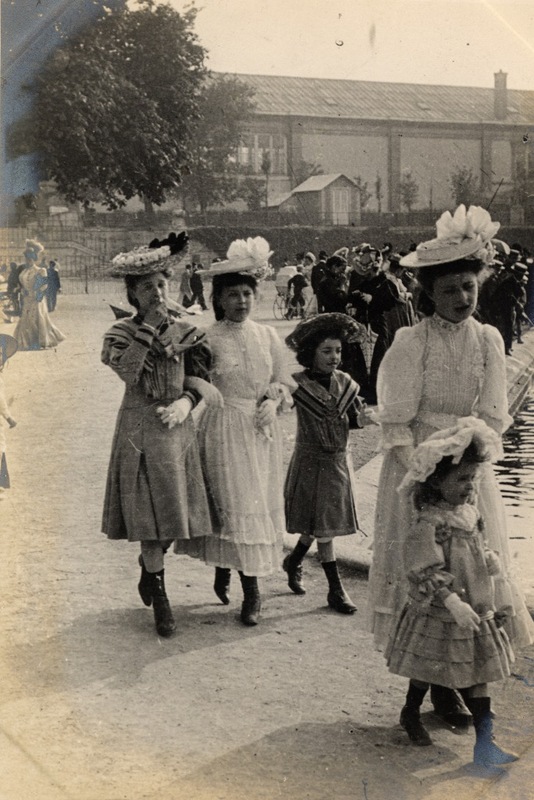 Although we know it shouldn’t be surprising that women wearing Edwardian fashions are walking around as naturally as Parisian women today walk around in modern clothes nevertheless it is. By the standards of 1906 we wear very little clothing and we see ourselves as casual and relaxed. 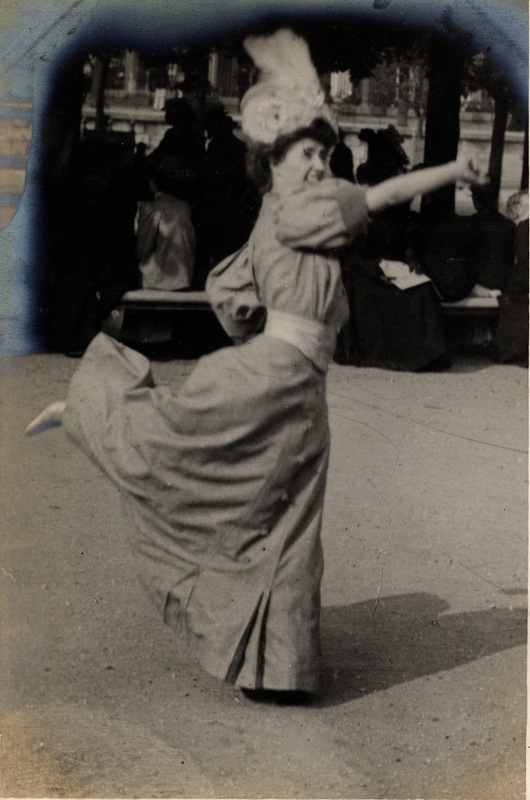 But the women Sambourne took photographs of were just as modern and enlightened. 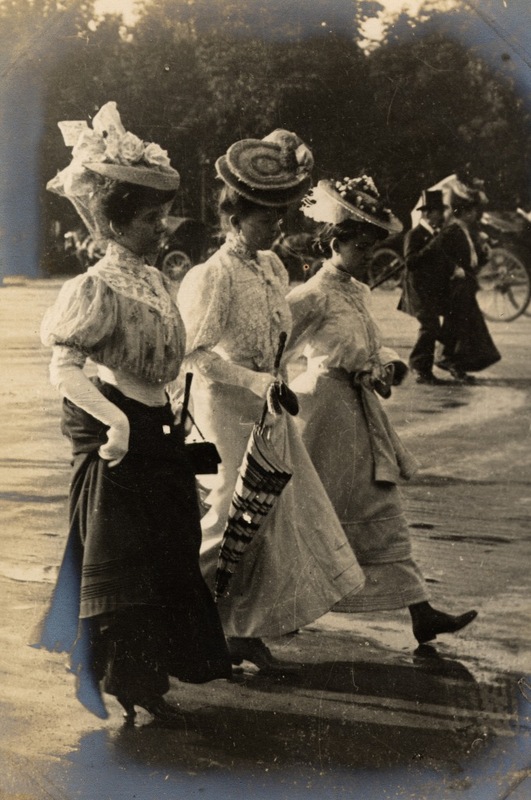 Three women walking briskly along. Mother, sister and daughter? Is the ground a little wet underfoot, hence the umbrellas? 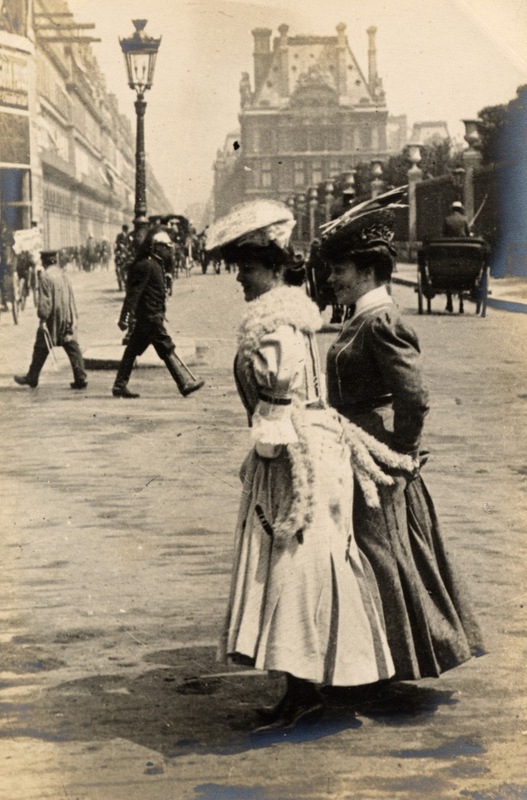 Just as today people came out onto the Champs Elysees to be seen, and just as modern women and men will stop to pose for a photo by a style blogger so Sambourne had some willing subjects. 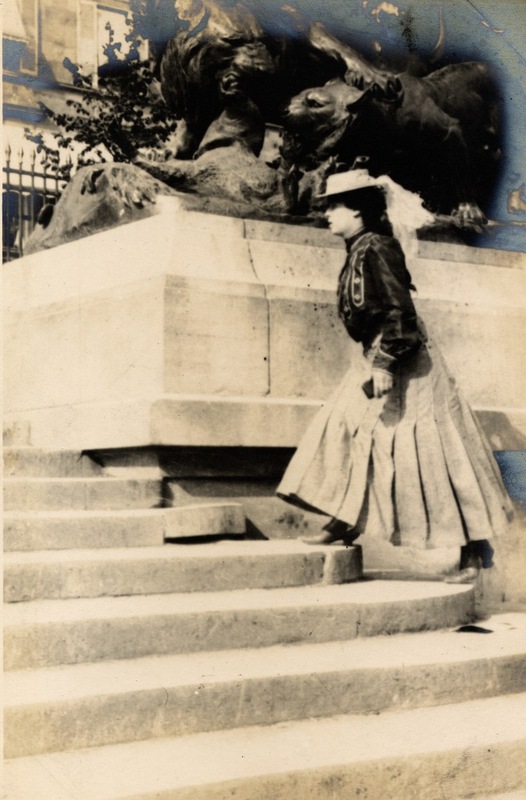 This is someone he knew, Madame Helen DuBois in the Tuilleries Gardens still a favourite spot for fashion photographers. Madame (or was it Madamoiselle?) 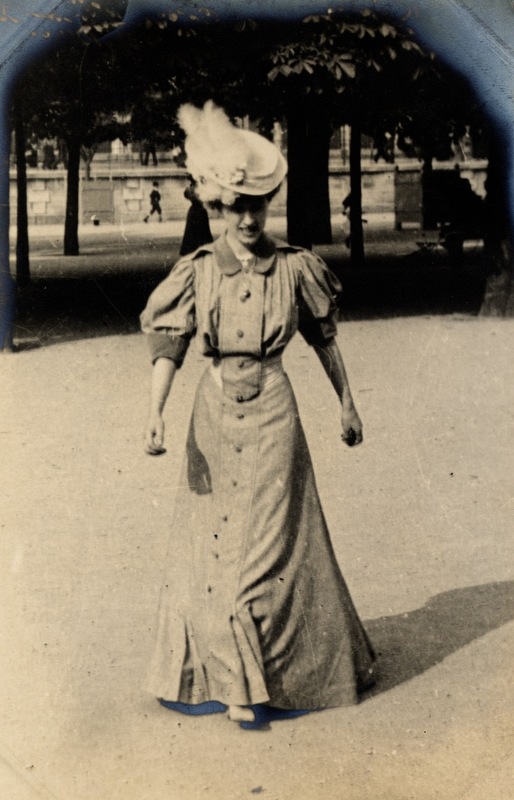 DuBois then demonstrates as if we’d asked her how little she felt constrained by her outfit. 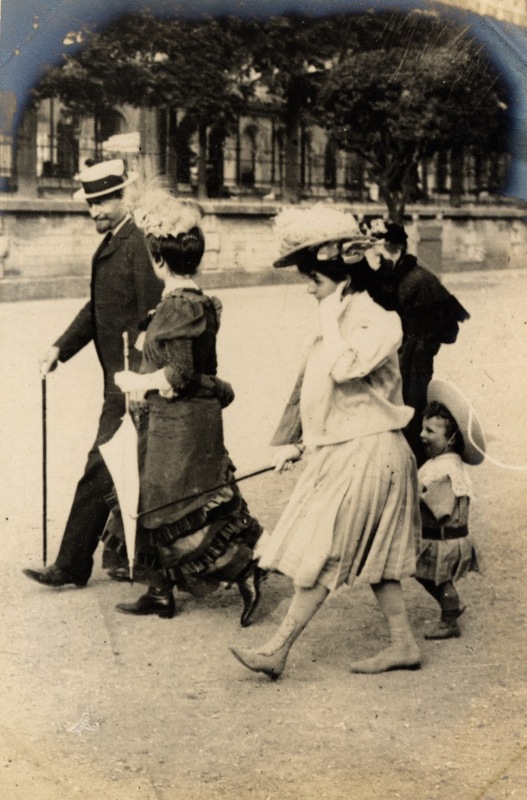 Look at the two extravagantly dressed women on the left behind the family. I wish I could have slipped Sambourne a few rolls of colour film. Mother and daughter, or mother-in-law and daughter both in mourning for another family member? It looks like a warm day. 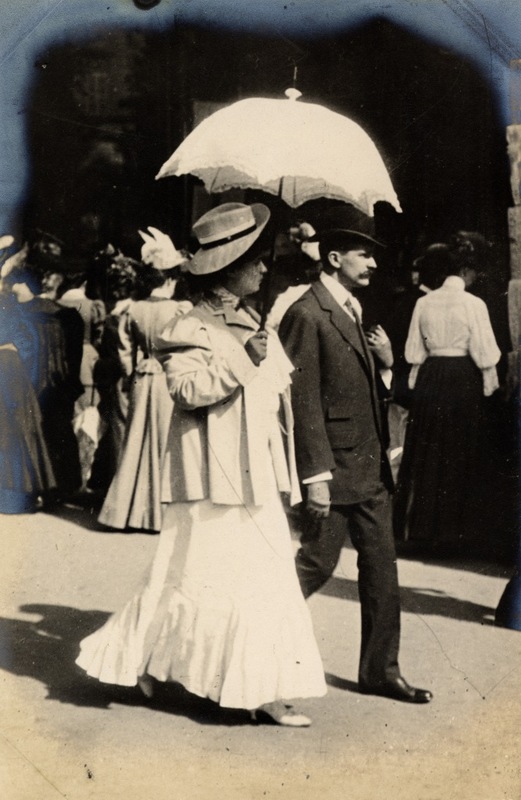 The woman below is using her parasol. He went on holidayseveral times in his final decade so we may see more of him yet. 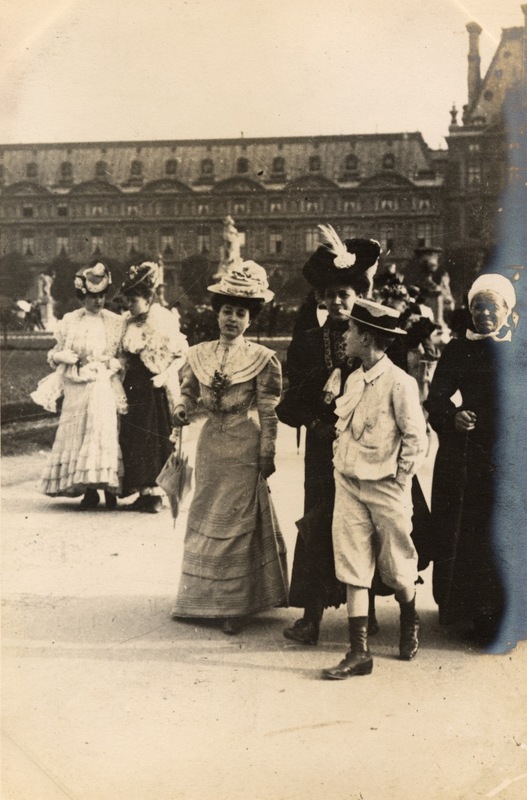 This entry was posted on Thursday, May 10th, 2012 at 12:10 am	and tagged with photography and posted in 20th Century, Edward Linley Sambourne, Fashion. You can follow any responses to this entry through the RSS 2.0 feed. Merci beaucoup Dave for another very interesting and enjoyable series of photos. Your work is appreciated. Exquisite pictures and nice commentary. Thank you so much! HELLO! My name is LOU TAYLOR(Prof. of Dress and Textile History, UNiv. of Brighton, co-author with Amy de la Haye and Eleonore Thompson of book plus expo at Brighton Museum about MESSEL family’s dress.) – done in 2004. I am thrilled by this site and photos, AMAZING. THANKYOU. 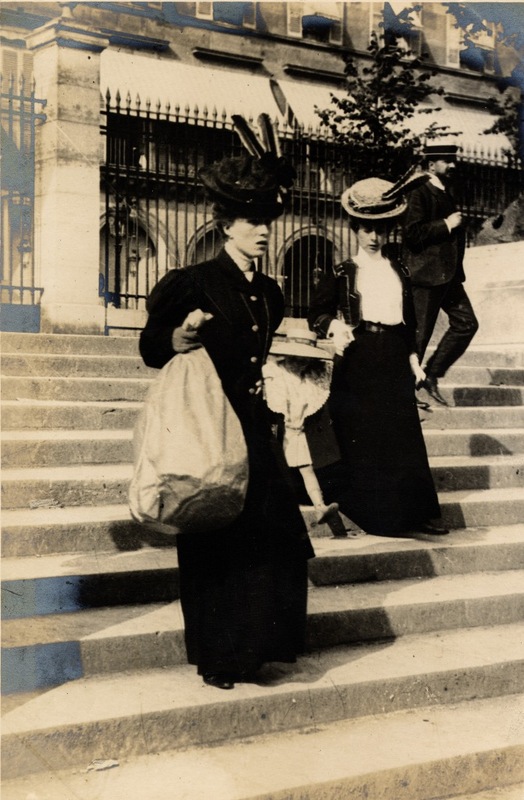 I write to ask if I could use the Sambourne Photo 17th Sept. 1906 of 3 girls walking on beach at Folkestone in the wind in a chapter I am writing for a BErg book called FASHION STUDIED. How can I get permit to do this and how much would that cost me please? futuro puedo decirte que voy a venir mas a menudo.